Water, water, everywhere, so let’s go have a drink! The primary mission of a shower is to get you clean. The associated mission–especially when the shower is on an upper floor–is to contain the water necessary to get you clean. And you probably also want to avoid water containment side effects such as mold spores and rotten framing members. Since we were completely in charge of tiling the bathroom, we inherited the workspace with sheetrock installed everywhere in the bathroom except right around the shower. The missing shower walls were a little confusing, because we thought that the sheetrockers would just keep putting wallboard around there, albeit cement or tile backer board. We waited for the sheetrockers to come back with cement board, until I finally called our builder and found out … that was on us. If you are splitting up tasks with a contractor, this is the sort of issue you’ll want to define! We were fine with doing it, just blissfully unaware. Job one, then, was installing a vapor barrier. This is just a 4 or 6 mil plastic sheet around the outside of the shower area — a last defense if water gets through everything else we will put in its way. Some people say not to do it, others say it’s essential; it was easy, so we did it. It’s just stapled in place, and then drapes inside the flange on the shower base. Next thing was lining the shower area with cement backer board. 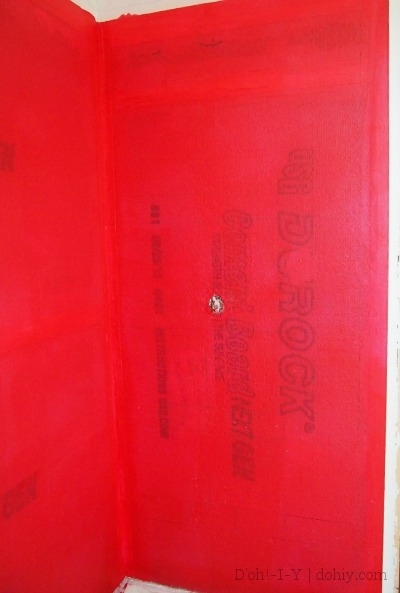 Cement board doesn’t absorb water and doesn’t foster mold and mildew. 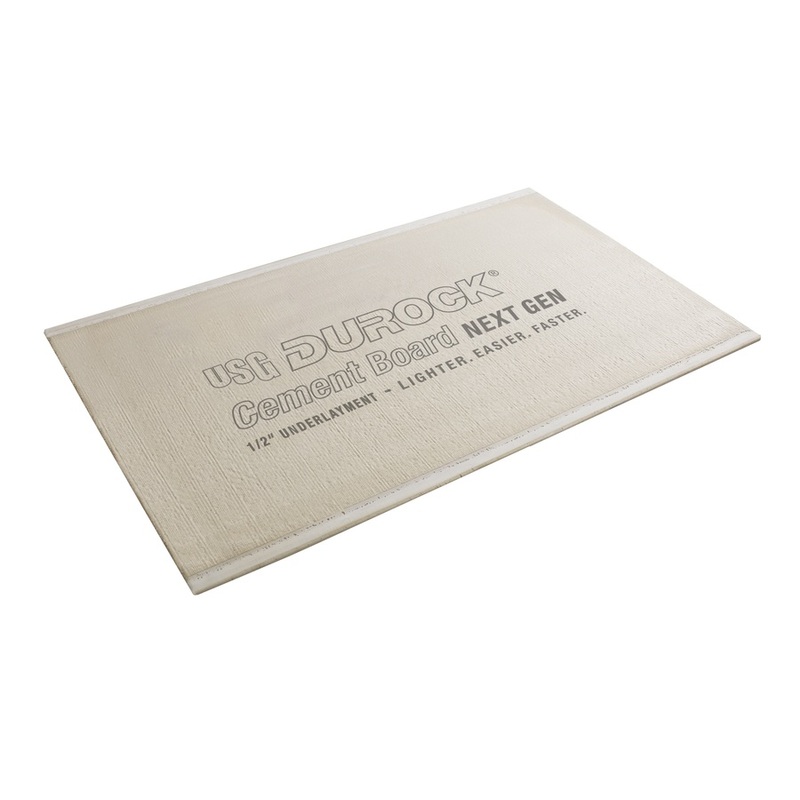 Durock or Wonderboard (seriously) appear to be the most commonly available brands. It’s heavy! But brittle! That image says “Lighter” but it’s still HEAVY. Between the weight and its fragility, you’ll want to plan so you can buy the smallest possible sizes at a time when you have help to move it. You need half-inch thickness for walls. There are quarter-inch pieces that are very tempting, but they are meant for lighter duty. 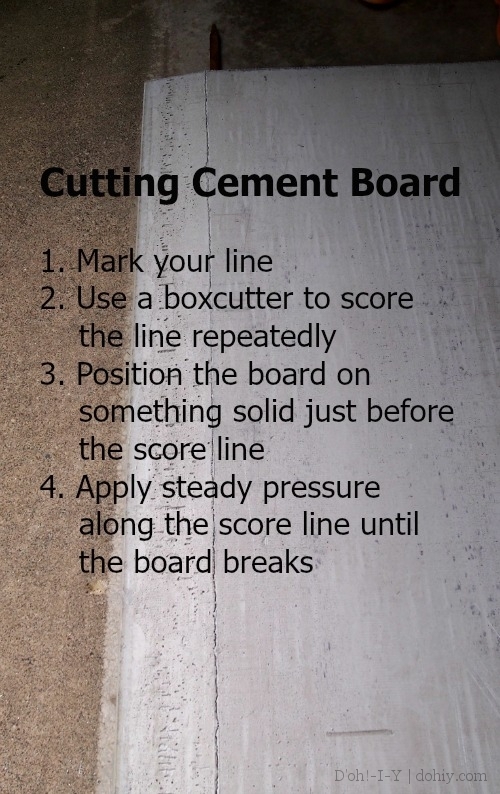 Even though most cutting is by scoring the surface and breaking the piece, there will be lots of dust and grit — pick up dust masks and new box cutter blades. Trimming up an edge — see how crumbly and gritty it is? 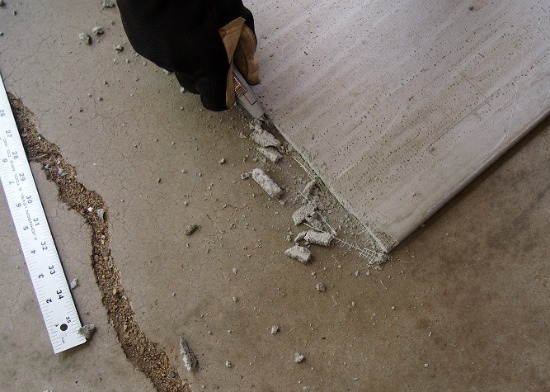 Cement board is installed pretty much like sheetrock (except using cement board screws), but because it is (a) brittle and (b) backing for tile, it needs to be installed as flat as possible. While sheetrock bends a bit when drilled in, cement board will just crack or pull through the screw heads. The Kev spent substantial time furring out the studs around the shower so that the cement board would be flat on the wall. Then we cut the cement board and put it up (check out this cement board tutorial for more detail). The cement board extends down over the shower pan’s wall flange, leaving a 1/4″ gap (achieved with tile spacers) that will be caulked later. After install, the joints needed to be filled. Instead of papery tape and joint compound (both of which can mold), use cement board tape and thin-set mortar to close up joints. We also had to fiddle with the sheetrock/cement board intersection to make it line up neatly (another reason to fur out the shower studs), so we taped those gaps too. 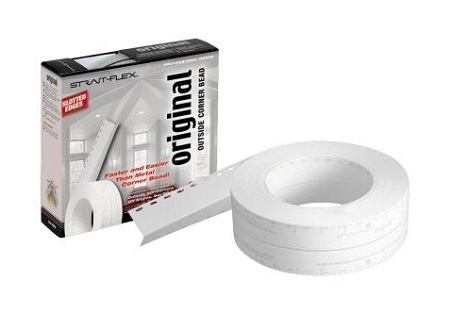 We used this, but there are other options; just make sure to get tape designed for cement board rather than for sheetrock. Embed the tape in thin-set mortar and smooth it out so everything is even. Then, I used a different type of tape immediately outside the shower enclosure. On the sides of the shower, there are two outside corners connecting with regular sheetrock. I used corner tape that you wet down and smooth into place to make those angles strong and defined. Ok, if this wasn’t all laborious enough, I decided to coat the cement board with waxy waterproofing goop. Many internet-commenting tile professionals hold that waterproofing cement board is pointless (the guy who tiled our main bathroom certainly didn’t do it). But, look, they are professionals. If I’m tiling this puppy, I want all the back-up I can get. Goop it is. Said goop applies just like paint (but use old throw-away brushes or rollers). After an hour or so, add another coat to cover up any tiny holes you can’t see. They are NOT KIDDING about the RED. RedGard is around $50 a gallon, but guess what? No one ever finishes exactly a gallon, so you can pick up left-overs on Craigslist. I paid $20 for 3/4 of a gallon, and I have quite a bit left — I’ll probably sell it on for $10. With the vapor barrier, cement board, taped joints, and membrane coating before we even get to the tile, I feel good about keeping the water where we want it. Should we ever end up showering in there. 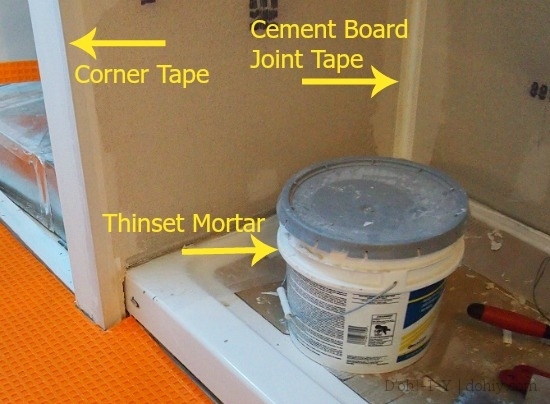 This entry was posted in Bathroom, Construction, D'oh!, Walls & Floors and tagged how to install cement board, putting tile backer in shower, redgard on cement board, using cement board in bathroom. Bookmark the permalink. Woah! So jealous of your shower. Looks great. Many moons ago, when we thought we were moving foward with our, I spend probably 2 days straight researching the best way to waterproof the shower without spending a billion dollars. Everyone has an opinion and swears their way is best. I cant wait to see it tiled! You are the best, Sarah — still not done with the tiling, though. Gah! I would think that making sure that a shower is waterproof is very important. It would be terrible to have it leaking, or get behind walls, and mold starts to grow. I wonder if the vapor barrier sheet would be a good way to keep water from getting in the walls. I would talk to a professional and have them come and do the job correctly. It’s extremely important, I agree! I did talk to several professionals before using this approach. 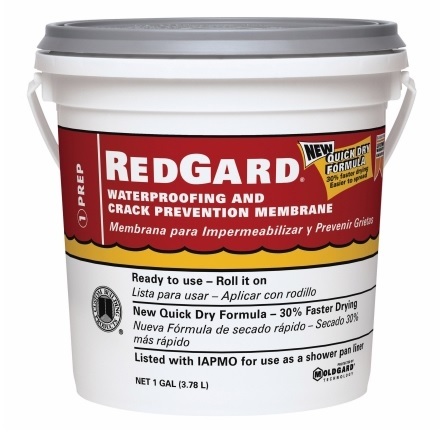 The concrete tile backer, vapor barrier, shower pan flange, and Redgard are supposed to work together as a complete system, and were recommended to us by several folks. If it fails, that is totally on me, but so far, so good. 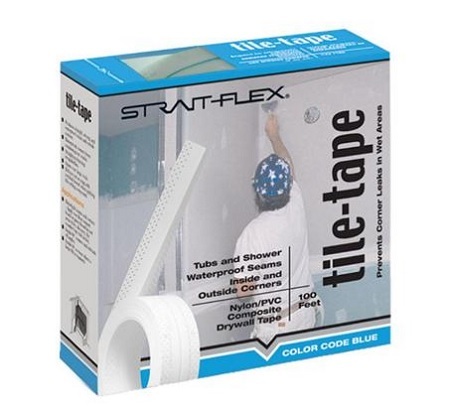 I had never seen anyone use Plastic behind the backer board, most of the tile and stone contractors I worked with back in California used either bitchathane which works well if used its primer, or felt paper with along with a float or the backer that you used. The Red membrane coating works very well but in some cases you have to be careful how far you spread it I find it in houses where it bleeds through the paint. either way it looks like a pretty solid install. Thanks so much, Jacob — we kept the red stuff strictly under the tiles. It would definitely be a problem under paint, I bet. We are needing to remodel our bathroom since last week it flooded and caused mold to form. It was great to read that cement board doesn’t absorb water and doesn’t foster mold and mildew. I will sure keep that in mind when we are remodeling this week! Is there a reason you left the cement board 1/4” off of the shower pan? Did you set it on the inside of the pan lip but not quite sitting on the pan? I would think, even with caulking, this would be a place for water to enter. Getting ready to do my shower and just wanted to clarify!! 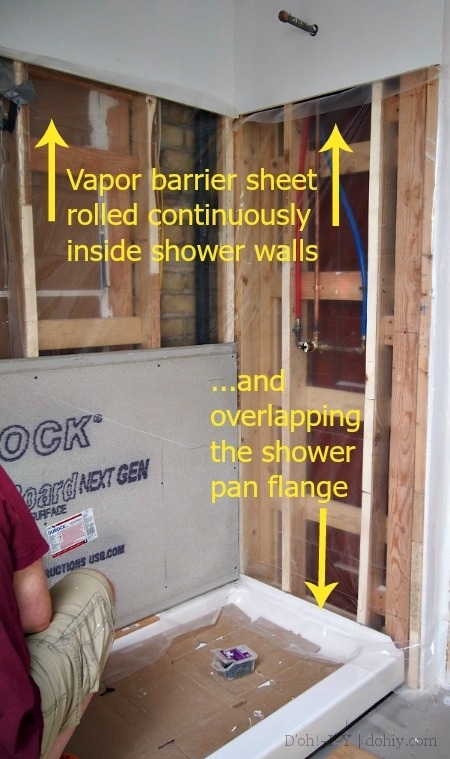 Many write that vapor barrier should only go just up to level of shower head or so. Above should be open for air circ. Your reason to go to ceiling? 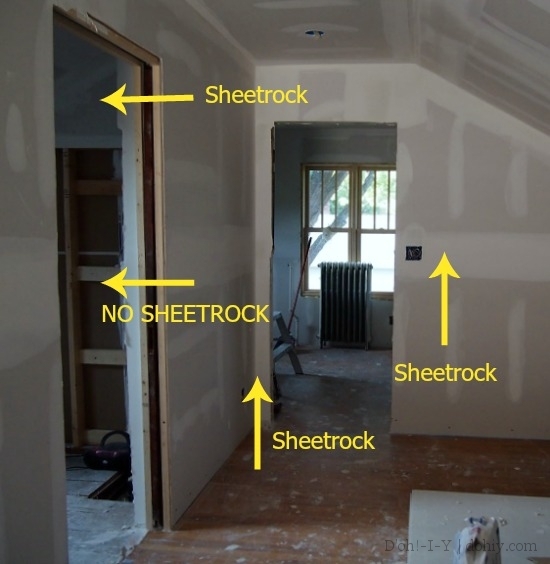 JW, hi — the vapor barrier is only up as high as a pre-formed shower surround would be, and it’s just sheetrock over studs above that. It’s open at the top. I took the tiles higher than the vapor barrier, though, but they don’t get wet.